A place with fertile soil and cold weather, Sagada produces one of the freshest and sweetest tasting vegetables found in the country. Upon strolling around the area, I notice that most of the places to dine at are actual homes of the locals. They allot a small dining area for visitors and tourists. Our first stop was Yoghurt House, what was once a one floor dining place has grown and expanded to two floors. I was excited to try this place out since it is one of the favorites among tourists. I was looking forward for the Pasta with Red Sauce, thinking that they used the big and plump tomatoes I saw in the market. It was a big disappointment, the sauce tasted exactly like it came from the ready made sauces that's sold in supermarkets. I've heard a great deal of the Herb Rice, the place even smells of it when we entered. But upon first bite, I was utterly dumbfounded. It was just ordinary garlic rice with curry powder. The redeeming dish that tasted satisfactory was the Vegetable Tempura. Crunchy slices of eggplant, string beans and peppers. Finally, I found something that I really liked in this resto.The dessert that people are raving about and I definitely agree with them. This is no fro-yo or store bought yogurt in cups, this was the real thing. Thick, creamy and sour homemade cultured milk. I preferred my yogurt with a sweet fruit topping to balance the sourness of it. 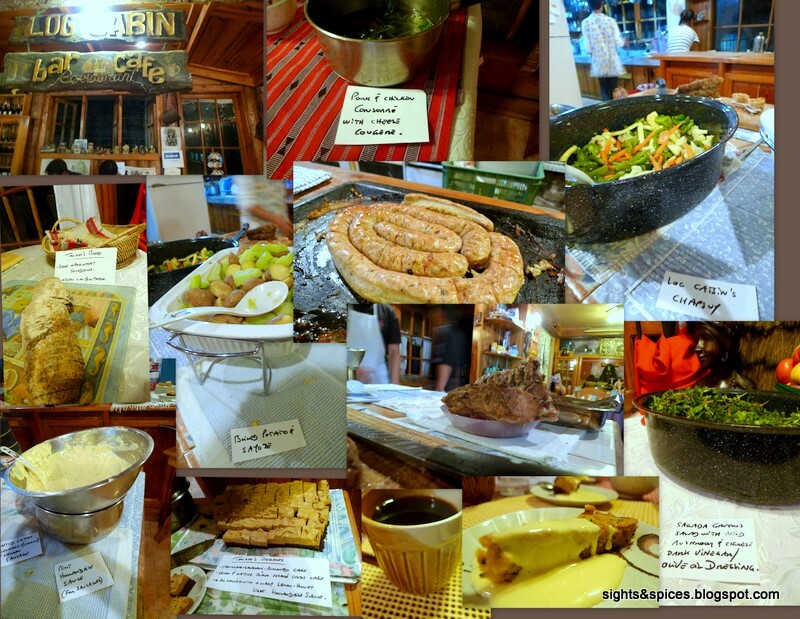 If there was one home/resto I was so excited to dine in was at The Log Cabin. It is specifically known for the Saturday Night Buffet. On this day the owner Chef Philip or locally known as Chef Aklay (this is his Igorot name) prepares the spread himself. The menu varies depending on his mood and the availability of the ingredients during that day. No ordinary person can set up shop in Sagada, one has to be a Kankanay Igorot to start a business. Chef Akaly is married to one thus they open their beautiful home for dinners. I started my meal with the homemade Dark Whole Wheat Sourdough Bread. Though I wanted my bread warm, the bread was really nice, the crust was crunchy and it has a soft-chewy center. The Pork and Chicken Consomme with Cheese Cougene was flavorful and hearty. It was the perfect company for the cold weather outside. 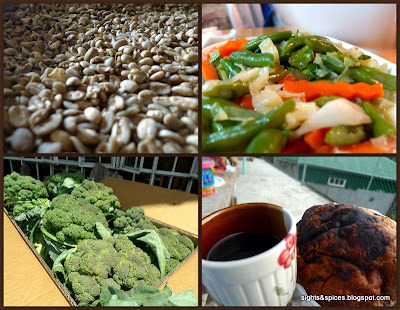 The Sagada Greens with Wild Mushroom consists of different leaves that I'm not familiar with. It tasted so fresh, the vinaigrette didn't overpower the flavor of the veggies. This is one of the best salads I ever had. Log Cabin's Chopsuey (Mixed Vegetables) tasted really simple.Yet again, it was the fresh vegetables that made this dish exquisite. The Roast Pork tasted ok, it was tender and moist. If there was one dish that everyone was raving about, it was The Sausage with a Mint Hollandaise Sauce. The sausage was delicately flavored and spiced and the sauce perfectly complimented it. I might have eaten a dozen slices of these. There were two desserts that was served that evening, I wasn't really too excited on these since I'm really not much of a dessert person. This was until, I took a bite of the Chocolate-Calamansi Moscovado cake with the Lemon-Honey Light Hollandaise Sauce. The small squares has a fudge-y chocolate-y bottom with a creamy Calamansi moscovado mousse on top. The Lemon and Native Black Sesame Seed Cake has a texture of bread pudding. What made both desserts divine was the lemon-honey hollandaise sauce. The combination of the tangy, slightly sweet sour sauce and the sweet desserts was a match made in heaven. I've tasted different local coffee and Sagada's coffee has became one of my favorite. The beans were slowly boiled and brewed in a steel pot. It was a strong, bold and smooth cup of coffee. The coffee was the perfect ending for a great tasting and filling buffet that costed only Php 499. Before heading for the caves, we had lunch at Salt and Pepper Diner. Just like The Log Cabin, this was an actual home with a small dining area for tourists. The food here are decent home cooked meals, my only gripe is I find the prices too steep. The Lechon Kawali ( Pan-Fried Pork) meal tasted ok. It came with rice and a side of mixed vegetables. The Vegetable Curry was nothing extraordinary, it was just sauteed vegetables mixed with curry powder. If there is one dish that is a must try in Sagada, it would be the Pinikpikan. The Pinikpikan is basically chicken soup but prepared differently. It is prepared by beating a live chicken with a stick, it is supposed to bring out more flavor out of the chicken when cooked. Most restos in Sagada doesn't readily serve the soup dish, you have to order it beforehand so that they'll be able to prepare it. Luckily for us when we went to Pinikpikan House, the owner made a batch for the day. The Pinikpikan Soup tasted like no other soup I had before. Aside from the chicken, it has slices of pork, vegetables and to my surprise...feathers. I asked the owner on the process of making the soup, she explained that after the chicken beating, they roast the chicken whole with feathers on. After of which they chopped the chicken down and proceed on making the soup. Roasting instilled a very smoky flavor in the broth, I was taken aback at first but as I took another sip I started to like it. The slices of pork in the broth turned out to be one of Sagada's indigenous food. It was called Etag, a thick slab of pork cured with salt then smoked. In stores, I always see bottles of fruit wines for sale. Since we were having an indigenous meal I decided to go all the way and ordered a bottle of the Piitik pear flavored rice wine. The wine smells of pear and it tasted really interesting, at first sip it was sour then the sweetness undertone follows. It kind of reminded me how good quality vinegar tastes like. After our drinking session that evening, we needed something to perk us up the morning after. We headed to Bana's Cafe to have the famed Amunin or Kopi Luak Coffee. When we arrived, we noticed that there were beans being sun dried right on the street. There were also a group of locals picking beans from a bilao (winnowing basket) while chatting. This shows how fresh Bana's coffee beans are since they do this every morning. I've tried Kopi Luak before and Bana's version tasted similar to what I had. It was smooth and has no bitter after taste though I was looking for a strong and bold flavor from it. I was kind of disappointed about it. The regular brewed coffee was a winner. Upon seeing the crema on top and smelling the intoxicating aroma, I knew that I was about to have a great cup of coffee. The coffee tasted beautifully! One of the most talk about dessert in Sagada is the lemon pie in The Lemon Pie House. Just like the Yoghurt House, the bright yellow colored resto has expanded to accommodate the growing number of clients. Using locally grown lemons to make the pie, it was simple and addictive. The crust was perfect, soft and crumbly. On top of the filling was a spongy cloud like meringue. The filling has a zesty, sweet, sour and minty cool feel. All the elements complimented each other so well. I just had to devour another slice after I had one. Having Lemon Tea with the Lemon Pie would seem too much of a lemon rush but the hot tea washed down the pie really well. If there is one bakery in Sagada that's worth the visit, it's Navales Bakeshop. They are known for the sweet-smelling, moist and tasty cinnamon rolls. If there is a phrase to describe my Sagada food experience, it was good old home cooking. Everything was simple and cooked from the heart. I do hope that the restos would offer more indigenous cuisine rather than cooking something to cater to tourist and foreigners (there's is a Chinese and Korean resto in the area). I also felt that most of the restos charged too much for their food, I wish they'll adjust and lower it down a little. 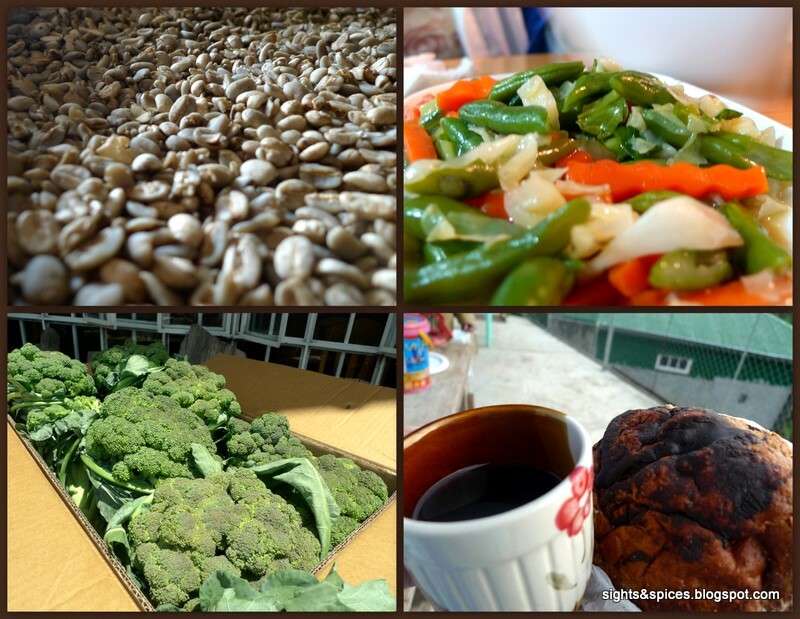 I'll always remember Sagada for two things...the freshest vegetables and the aromatic coffee.